As we're nearing the birth date of our newest little one, I've probably spent less time reading more time just sitting and staring at anything and nothing. Feeling a bit more tired these days, I'm working on motivation to stay awake all through the day to give me a better chance at sleeping at night. To that end, because it takes less thinking effort and I find it both informative and enjoyable, I've been watching documentaries via Netflix. Here are a few I've seen, along with my brief thoughts. My sister-in-law watched The Business of Being Born and I was curious about it. Very much a pro-natural delivery process - (taking place at home when that can be managed and arranged!) - it's a very intriguing documentary. Now, I'm not a natural-birth candidate. I agree with the reasons that are given in the film as to why you would want to do that if at all possible. My history is a bit more complicated though and it is impossible. So while I can agree with the arguments made, I don't find them safely applicable to myself. Truthfully, I get a bit irritated when people insist to me that I can delivery naturally. No, actually, I cannot. As I said - I'm totally in support of it when it's possible and totally in support of c-sections when the are necessary. The only argument that bugged me (to no end) in this film was the one made for natural birth because doing so releases certain hormones in the mother which promote bonding to her new baby. One of the doctors in the film said that he saw a mother who had a c-section who was not interested in her child. I'm not going to argue against such a hormone having an incredibly effect but I will argue incessantly that that's a poor argument to use to convince a woman to have a natural delivery. I am very. interested. in my kids. VERY! Plus, as an adoptive mom I'd have to say that the argument is kinda bogus. I didn't lay eyes on my second son for the first 9 months of his life. But I assure you, I cried and held onto that boy for dear life when he arrived and I think of him entirely as my own. I didn't see my first born for 10 minutes or so and that did not effect my ability to bond in the least. God knits hearts. Hormones not always included. Anyway. It's an interesting piece but I took some issue with it. If you are pro-natural birth you will absolutely LOVE this documentary and will no doubt become very riled up about it! It's really remarkably well done (I thought anyway) and, like I said, if my situation were different, I might be riled in a different direction. 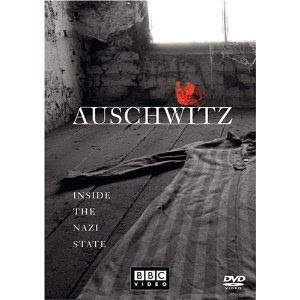 On a totally different note, I watched Auschwitz - Inside the Nazi State (a BBC production) which tells the story of the beginning of Auschwitz to its dirty, horrible end. Over 1 million people died in this Nazi Concentration Camp - more than all of the American and British troop numbers combined! "Death, death, death. Death in the morning. Death in the evening. Death in the afternoon. We lived with death." "We felt that we could be killed at any minute - and we would not know why." Documenting how the Nazi's perfected their craft of killing, this is certainly a chilling documentary. But necessary. Nothing about it is gratuitous. It doesn't need to be. The Nazis made life horrible in their own right. One of the most impacting things about the whole documentary, to me, was feelings of retaliation and revenge that became so much a part of the survivor's lives. I can certainly understand their sentiment in not caring what happened to their German captors but there was also a sense of bitterness and sadness that was difficult to take in as they shared their personal stories. Again, not that they aren't expected to have such attitudes. but it can take you aback. Part of you expects them to have pity towards those who suffer, seeing that the survivors suffered so greatly themselves. But the general theme and attitude was that it's "every man/woman for themselves" and that just creates a cycle of hatred and demise. Very intriguing. Both of these documentaries were definitely thought-provoking in their own way. If you ever get a chance to watch either, I recommend both (for different reasons, obviously.) They stir the brain. I've discovered I like a good documentary - when it's well done. Both of these most certainly were. Thanks for the documentary recommendations! I like watching documentaries and both of these sound interesting. Right now we're watching one on Netflix called God in America: How Religious Liberty Shaped America. It's quite eye-opening to see the cycles of religious freedom/persecution. I, too, will have a c-section in a couple of months, so it's always great to hear someone saying that it's not ABSOLUTELY wrong! :)My first one couldn't have survived a natural birth. I agree, though. I didn't get to hold my first baby for 3 weeks and I love him with all my heart! And before my first one was born, I may have watched this documentary and been tempted by it all. Unfortunately, though, this pregnancy I've tended to avoid reading or watching all things pregnancy. I get riled up when any aspect of parenting is promoted as the ONLY correct way to do it. I wanted as natural a childbirth as possible, but I also wanted to be at the hospital "just in case." It would have been hard to forgive myself if something happened that could have been handled at the hospital but would have been dangerous at home. Cassandra - Thanks for the recommendation back! I'm going to put that one in my line-up. I am very pro-natural birth, so I think that documentary is definitely one I will watch! But I agree that using bonding hormones as an argument for natural birth is far-fetched at best and insulting to adoptive parents at worst! I also think that there are cases where c-sections are necessary. My sister, who wanted to have a natural birth, is having a c-section next week because her baby hasn't turned. I'm very thankful she has that option available to her! Natural birthing and breastfeeding arguments get under my skin easily. I may have given birth vaginally, but that doesn't make me love my kids more...and the fact that I am not capable of breastfeeding...doesn't sit well with me when others tell me I should try. I did. I had one who couldn't latch (probably due to apraxia)...and pumped for her drops at a time in hopes...second child had a terrific latch...and was hospitalized bc he was dehydrated. I just can't produce enough milk to feed even a newborn in its first days. Anyway. The email woes have continued. Today I attemptd to change my blog accounts...and must be I didn't do it completely bc it didn't work. Hopefully before this drains too much energy it will be figured out. My cousin did tell me how to back up the blogs...and I did this morning. I may have to begin from scratch...who knows. Hopefully it will be worked out though. We have a copy of "In the Womb- Animals" taped off the TV which includes the birth of a baby elephant. Might you be interested? I think dogs are part of it too. Um, could it be that the c-section mom showed little interest in her baby because she COULD NOT FEEL HER LEGS! And was so drugged she couldn't think coherently thus making her just want to sleep off the buzz? As a mom who has had FOUR sections, I'm just saying. I saw Bookworm1, like I said, about 10 minutes after he came out and was checked out. Then daddy followed him about as our pediatrician gave him the once over. Meanwhile, I was sent to recovery and I don't actually remember seeing him again for awhile. (As you say, I was, er, sleeping off the buzz.) BUT! I was TOTALLY at peace and content because I knew Daddy was with baby and that made me perfectly satisfied to wait (and sleep) and I was happy when they both came in the room together and I had regained some of my senses. Yeah, there are drawbacks to c-sections if you want to think in terms of drugs. However, I've recently had two close friends go through natural labors not as planned and one of them was so out of it from the process that she didn't really get to experience the instant bonding for almost a day later (thereabouts!) Therefore I still think that's a stupid argument because natural labor can clearly wipe you out and cause issues making it impossible to bond instantaneously just as well. Thanks for these reviews--I am thrilled to discover that both documentaries are available at my local library. My first delivery was vaginal, natural, all that but daughter aspirated meconium and was immediately airlifted to bigger hospital 90 minutes away while I stayed for a little over 24 hours. Hubby thinks she would have died had we attempted homebirth. Second was emergency c-section. Hubby thinks both mama and baby would have died had we attempted home birth. Next three children were all adopted. I love all five of them--passionately! A friend of mine showed me The Business of Being Born when Cory was a year old. I was already leaning towards using a birthing center (my best friend had her second 2 that way) because I had an absolutely horrible time in the hospital the first time around for what I'm fairly sure were unnecessary reasons. Obviously I thought about it hard and the birthing center is only 5 minutes from the hospital and is very cautious, transferring at the first sign of difficulty so I was pretty comfortable with them. That being said, it's been a long time since I saw it and the biggest overall impression I have is that is simply reaffirmed to me that many of the things I went through were unnecessary (for me and my baby).